This is the sixth installment in a series of articles produced collaboratively by the Tokyo Culture Creation Project and Tokyo Art Beat. In this piece, TABlog writer Yumi Song takes a look at how the “Tokyo Art Meeting: Transformation” exhibition at the Museum of Contemporary Art proposes new possibilities for art through works that fuse art with anthropology. This exhibition was a collaborative effort between Shinichi Nakazawa, a noted anthropologist and religious scholar, and Yuko Hasegawa, chief curator at the Museum of Contemporary Art in Tokyo. 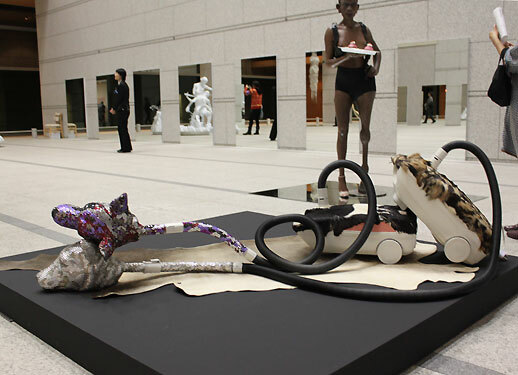 “Tokyo Art Meeting: Transformation” featured works by twenty-one groups of artists from fifteen countries that explored the boundaries between humans and non-humans, addressing issues related to transformation and metamorphosis. 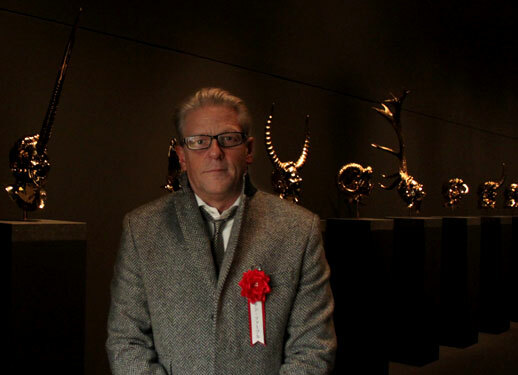 Works by prominent artists like Francesco Clemente, Matthew Barney and Jan Fabre were showcased alongside pieces by art students who had just embarked on their careers, such as Junya Oikawa. Ranging from Europe to Asia, the selection of practitioners was diverse and the variety of media wide. 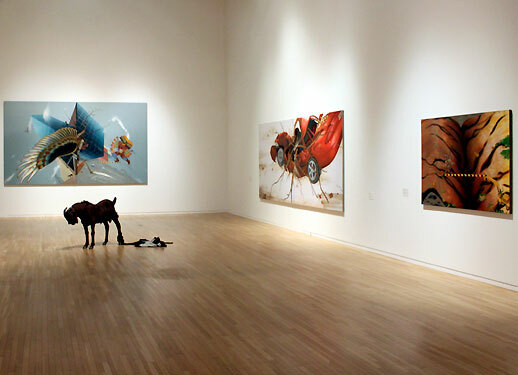 A number of artists have produced works depicting human figures fused with animal characteristics that represent the limits of trans-humanism. The biological definition of “transformation” is a shift in physical form. By incorporating within them an external source of DNA in order to achieve a genetic shift, so to speak, these artworks take on a repulsive appearance. This metamorphosis, however, also impresses upon us the strange sense of security embodied by these vital processes. 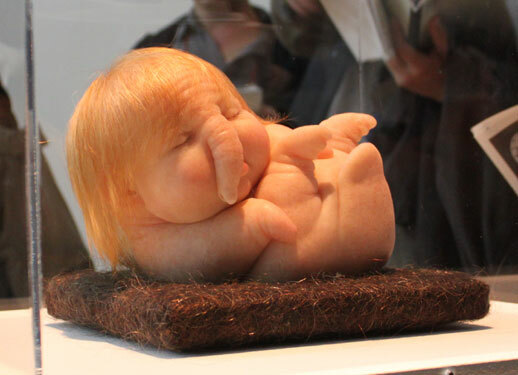 An example of this is Patricia Piccinini’s ‘Newborn Baby’. Piccinini, who has a strong interest in bioethics and the environment, has created a living, breathing human-platypus “mutant” whose physical form has remained unchanged since ancient times. Staring silently at this bizarre yet strangely adorable infant creature, you can almost hear it breathing. Bharti Kher, who explores identity issues and the role of women in her work, has several works on display at this exhibition. Her “Hybrid” series of photographs portrays mutant creatures that resemble a cross between women and carnivorous birds. A number of canvas works feature bindis (forehead decorations worn by Hindu women) as motifs, while her sculptural work ‘Hungry dogs eat dirty pudding’ depicts a cross between a dog and a vacuum cleaner. 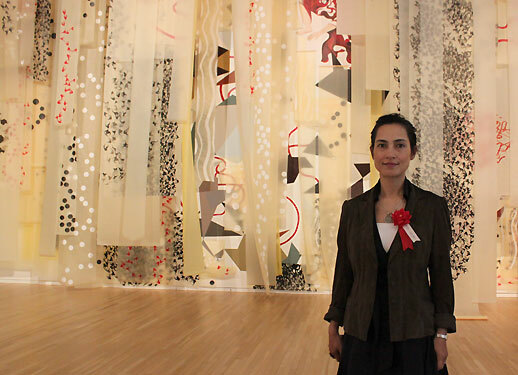 Shahzia Sikander, who studied traditional miniature painting at university in Lahore, Pakistan, uses these techniques to create videos and installations that examine the fusion of animal and human attributes, plural identities and power structures in contemporary society. Transformation, of course, is not only a matter of physical form: it also exerts an influence on one’s inner being. 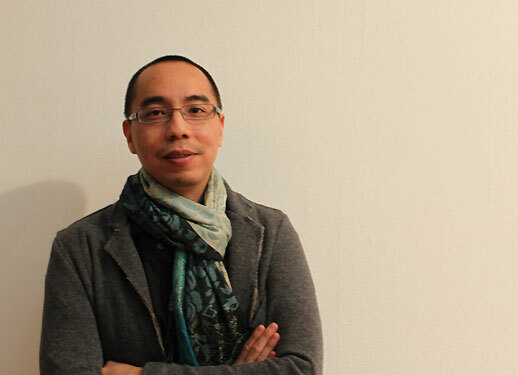 Apichatpong Weerasethakul is an artist and filmmaker who won the Palme d’Or, the highest honor at the Cannes Film Festival earlier this year. His documentary video ‘A Man Who Ate an Entire Tree’ follows a group of people as they struggle against the thick undergrowth of vines in a Thai jungle. 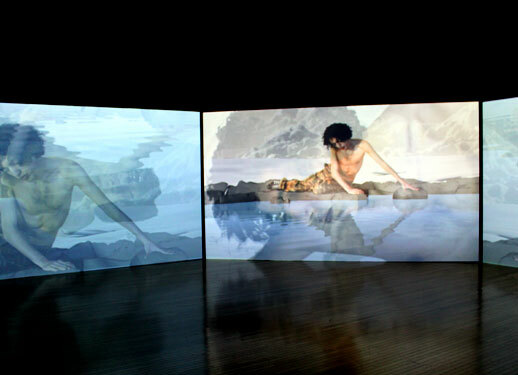 Displayed in the same room next to this video installation is a related series of photos by Weerasethakul depicting a man lost in a trance brought on by hallucinogenic plants. 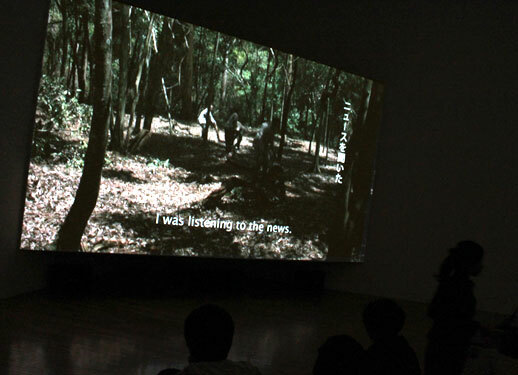 Naoki Ishikawa, an outdoor expeditionist and photographer who scaled the world’s highest peaks on all seven continents in 2001, is showing a video work entitled ‘Polar Transformation’, in which the curator for the exhibition Yuko Hasegawa interviews him about what went through his mind while scaling Mount Everest. Sarah Sze, on the other hand, has created an installation that documents transformations over time by showing us little fragments of trivial events that unfold within a miniature garden. For Sze, transformation seems to be a question of structural change. Our freedom to act within this world is subject to a variety of constraints in visible (and invisible) ways. In order to overcome these restrictions, therefore, it becomes necessary to effect change within oneself. One possible approach is to discard one’s human form and take on animal-like characteristics. At a press conference, co-curator Shinichi Nakazawa explained that this exhibition attempts to demonstrate how a transformation of this sort can be achieved through art. What exactly does it mean for one’s freedom to be subject to these various constraints? And why is it necessary to shed our current physical state in order to overcome them? Born into a supposed state of non-freedom and having no experience outside the confines of this inveterate condition, we are unable to perceive where the boundaries of this so-called “freedom” even exist. Perhaps the notion of freedom itself is a fictitious construct whose existence and contours are ill-defined. If this is the case, we need to embrace a continuous state of eternal transformation, because what constitutes freedom shifts the moment we think we have attained it. If this constant state of transfiguration is the only thing that remains unchanged, the act of transformation itself overlaps and approaches the condition of art, and becomes equivalent to it in the final analysis. In addition, it seems that what is on display at this exhibition is not so much transformation, but rather a process that is closer to metamorphosis. 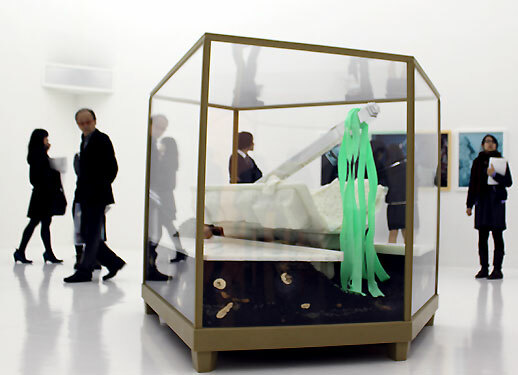 According to Nakazawa, the term “metamorphosis” was not used in the exhibition because, as the art critic Toshiharu Ito pointed out during a symposium held at Tokyo University of the Arts, what lies at the end of the process of transformation and reincarnation is always the promise and lure of money and capital. Even if, as Ito suggests, the end state of this process of transformation may constitute total meltdown, it seems clear that our restless shapeshifting will never acquire a clear purpose and objective. Perhaps this act of fusion and integration with the world is what Nakazawa would call a state of freedom. If so, is it then necessary to effect a transfiguration in our current physical form? The key to understanding how our relationship to the world is governed seems to lie in self-knowledge and the fact of our bodily existence – the recognition that we possess a physical form that cannot be altered. Perhaps these constant transformations represent attempts to arrive at just this sort of understanding. 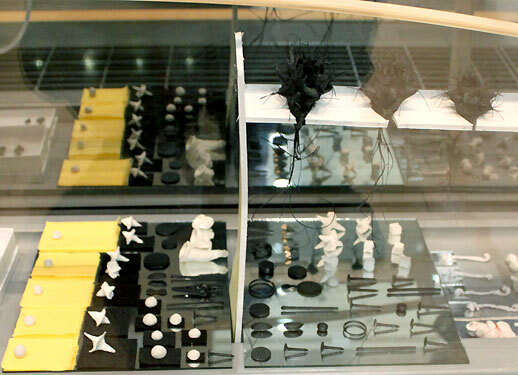 Also on display was an archive of material by Masanori Oda, who works as an artist under the pseudonym Ill Commons. Oda’s practice is based not on transformation but rather reform, or revolution, to put it more bluntly. 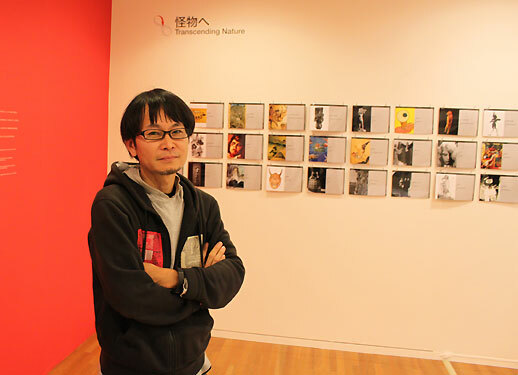 His exhibit consists of various documents that address the themes of transformation and metamorphosis, ranging from anthropological materials to manga comics from various places and times. For this particular exhibition, Oda wanted to work not just with art museums, but also other non-art institutions that handle a range of historical artifacts. 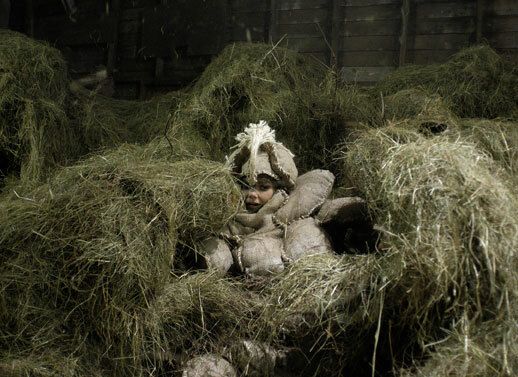 The result is an archive with a historical orientation that also offers us the occasional glimpse of revolutionary, ambiguous intent that goes beyond the mere act of documentation. An extensive program of related events including performances, artist talks and educational activities is also scheduled for the duration of the exhibition. In addition, a series of performances, discussions with young emerging artists, and exhibitions of work by both current students and alumni of Tokyo University of the Arts will be held in collaboration with the university as part of “Tokyo Geidai Trans Weeks”. How do these artists represent and depict the freedom that we seek to attain through our constant transformations? 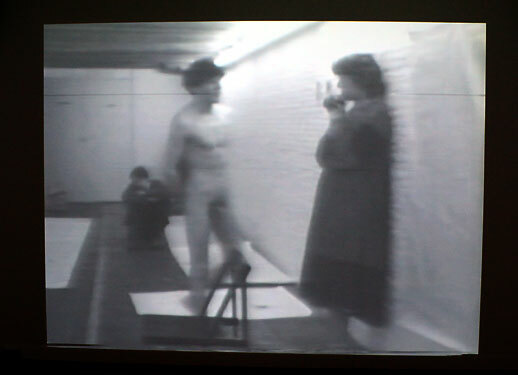 This is the question that the exhibition’s considerable number of video works in particular seeks to address. With its extensive reach and compelling approach, “Transformation” demands repeat viewings to fully digest what it has to offer. Yumi Song is a contemporary artist/autodidact/Virgo who lives in east Tokyo with her cat, Kobushi. She makes installations and other language-based works, and keeps a blog about her daily life, “Yumi Song Seisaku Kiroku”.